Magnolia trees are used as a focal point or specimen planting in landscape design. They are known for their beautiful spring blossoms. There are several species of magnolia, from the large Southern magnolia tree to the popular saucer magnolia, which is a multi-stemmed tree. Magnolia trees are susceptible to various fungal diseases, such as leaf spot, verticillium wilt, nectria canker and heart rot. The magnolia tree can be attacked by 15 species of fungi that cause leaf spot. Signs of leaf spot are brown, yellow or black dead spots on the leaves. Sometimes these spots grow together, increasing the size of the dead leaf material. In severe cases of leaf spot, the leaves will fall to the ground during the growing season. To control the disease, the fallen infected leaves should be destroyed. Verticillium wilt is caused by the fungus verticillium dahliae. This fungus is able to survive in the soil and in the roots of an infected tree. It is spread when the soil is tilled or cultivated, by water irrigation and by infected pruning tools (when diseased plant material has been pruned and the tools have not been disinfected). Symptoms of the disease are that the leaves on one or several branches will wilt and stick to the branch. Wilting occurs during the growing season and progresses to other branches. This disease can kill the tree, and there is no known treatment or control method. The way to manage verticillium wilt is that you should avoid planting in infected sites. Nectria canker is also a fungal disease that attacks the magnolia tree. It can be recognized by found lesions or cankers that appear on the branches and trunks of the tree. They encircle the branches and trunks and the tree and eventually the tree dies. The best way to avoid fungal diseases is to maintain a healthy tree through watering and fertilization. It is also important to avoid injuring the bark as injuries/wounds are entryways for disease. Heart rot is caused by fungus that is capable of decaying the wood. The fungi enter the tree through branch stubs, wounds or any area where the wood is exposed. As the decay takes place, you will see the appearance of mushrooms (fruiting bodies), which are also known as “conks.” Heart rot can weaken and eventually kill a tree. Heart rot fungi do not attack healthy trees, so to avoid heart rot, you need to follow a program of watering and fertilization. 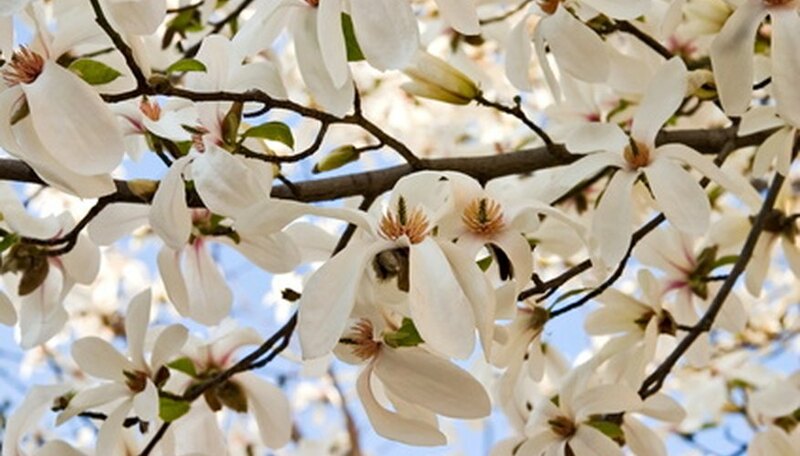 You must also remember to prune your magnolia correctly--do not leave any stubs, and be careful to avoid any injury to the bark or trunk of the tree. The bark of young magnolia trees is very thin and easily damaged. Damage can take place when you mow the lawn or trim the lawn too close to the trunk of the tree. To avoid any injury to the trunk of the tree, encircle the tree with a 2-foot circle of mulch. Mulching will keep the lawnmower and string trimmer away from the trunk, and it will also keep the weeds down.